Babli (Ranbir Kapoor) is a car mechanic who was brought up in an orphanage. He is good at heart but never tries to differentiate between good and bad. His life turns completely when he falls in love with Tara (Pallavi Sharda). What are those events that lead to a complete change of Babli’s life? Why inspector Chulbul (Rishi Kapoor) and his wife (Neethu Singh), a Police officer herself, Bulbul? Finally, does Babli change his life? Does Tara become his? These questions are humorously answered in Abhinav Singh Kashyap’s Besharam. Pallavi Sharda does justice to her role. Yes she acts. But is that all? She is very disappointing looks-wise and the way she carries herself. She would be very good as heroine ki saheli and that girl whom the hero ditches for the heroine... Else a dramatic sister... But, as a heroine of mainstream cinema, no yaar! Rishi Kapoor-Neetu Singh duo steals our hearts. They have this raw chemistry about them and their characters are interesting too. And the movie is a complete paisa vasool. A mindless masala movie, I would say. A hero... heroine... villain and chasing police officers... Then there are songs that come out of nowhere after every 10-15 minutes. 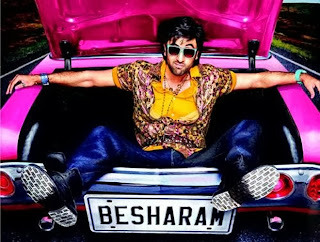 Besharam, the movie, is besharam when it comes to the plot and screenplay. It becomes tiresomely predictable and irritable too after some point of time. It lags and lags and seems as if it is leading to nowhere. The story itself is a big cliché and the songs are not that great either. Go for it at your risk. If you choose to go, don’t complain. You can’t expect a Dabang out of this! You can’t expect a charming Ranbir either! That's why the movie is titles - Besharam!